Indisputably, you have a lot riding on your tires. Indeed, many of today’s vehicles weigh at least two tons with some larger trucks and SUVs tipping the scales above three tons. With all that weight riding on rubber you might think tire safety would be foremost on every driver’s mind. Yet, tire management is often neglected as underinflated or worn out tires present a real and present hazard, areas of automotive safety you must not ignore. Your vehicle’s tires affect not just handling and braking, but also impact fuel economy. Consequently, the tires outfitted on your new car have been carefully chosen by the original equipment manufacturer. Tire warranties, however, are backed by the tire manufacturer, not the automaker. A copy of your tire warranty is typically bundled with your other important documents and usually reside in your glove box or other storage compartment. All tires, including this Bridgestone DriveGuard product, should be checked monthly for proper inflation. If you want to ensure long tire life, adequate handling and safe braking, your tires should stay inflated in accordance with the car manufacturer’s guidelines. In particular, that information is usually found on a placard affixed to the inside jamb of the driver’s door. In some vehicles the placard or sticker is located on the inside cover of the glove box. Auto Trends reached out to Will Robbins, Product Manager for Bridgestone Americas Tire Operations, for seasonal tips about tire care, especially the impact extreme temperatures can have. Thus, a sudden drop in temperature overnight can leave your tires underinflated. As a result, control can become compromised, especially when you need it most as in when driving on snow and ice. Two additional factors also affect tire safety: load limits and speed. Likewise, every tire has its limitations. Specifically, the amount of weight you carry in the car (payload) in addition to the vehicle’s weight itself (gross vehicle weight) will influence tire safety for better or for worse. There are three ways you can determine load limits. Third, open your owner’s manual. If all else fails, turn to the section of the owner’s manual describing tire information. You may not own the tools required to gauge your vehicle’s weight and carrying capacity (such as a scale), but through keen observation, you should see if your car is sinking under a heavy load. If it is, you must remove excess weight. Tires are also safety rated for speed. Most drivers adhere to road speed limits, but if you like to take your car to the track, you should understand that the letter ratings on the sidewall represent its speed ratings. Those ratings range from “L” for 75 mph to “(Y)” for speeds above 186 mph. Your owner’s manual will spell out rotation timelines and swap patterns, typically ranging from 6,000 to 8,000 miles. The swap pattern for rotating tires depends on whether you have directional or symmetric (or asymmetric) tires and the type of vehicle you drive. Do not cross your set of directional tires to the other side of the car without having them dismounted from the rim, turned over and remounted. With this in mind, performance models — especially sports cars — are much more likely to feature directional tires. Different tire rotation patterns exist for front-, rear- and all-wheel-drive vehicles. Your owner’s manual will list those options. Exactly when should you replace your tires? The industry rule of thumb is when the tread wears down to 1/16 inch. Otherwise, you can rely on wear indicators or bars located between the tread pattern in modern tires to assist you in making a determination. 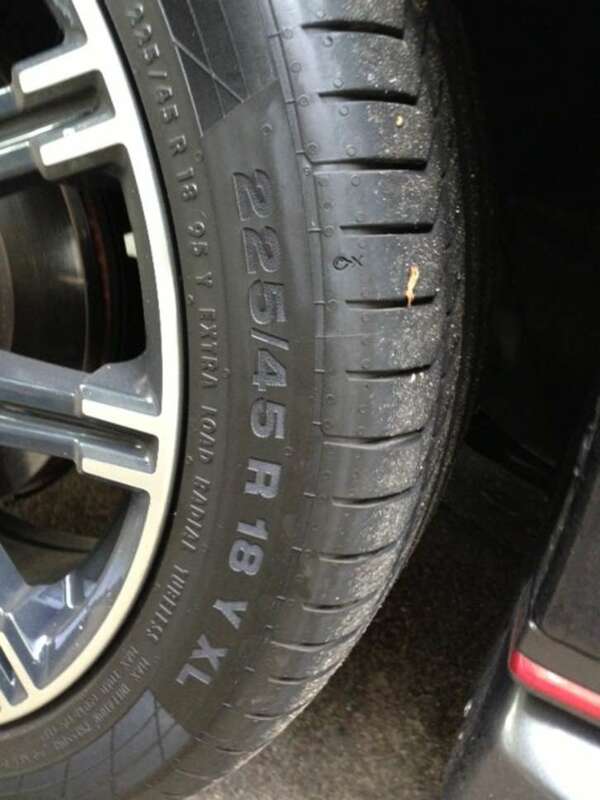 Specifically, these indicators appear when tires have 2/32 (1/16) inch tread remaining. Relying on tread depth alone to determine tire replacement is not enough. A tire’s age is another factor as tires gradually begin to crack and separate over time. Some car manufacturers recommend replacing tires every six years, regardless of wear, while other tire manufacturers say that tires can last as long as 10 years, according to Edmunds.com. 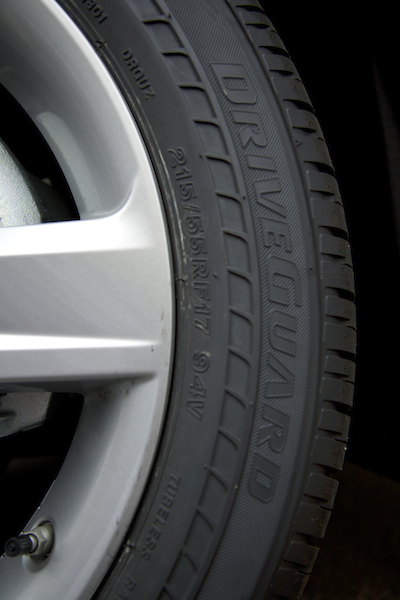 Tire safety is only one ingredient in ensuring a safe drive. So, when you rotate your tires, have your brakes checked too. Furthermore, you should have your tires balanced every other time you rotate your tires or whenever you detect a recurring vibration coursing through the steering wheel while driving. Photo copyright Bridgestone Tires of the Americas.